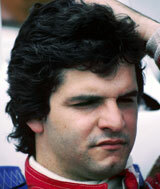 Chico Serra came to prominence racing in Formula 2 for Ron Dennis's Project Four Racing. In 1980 he made the step up to Formula One, driving for Emerson Fittipaldi's team, but failed to qualify more often than not. The next year he struggled again at Fittipaldi but scored a career best finish of sixth at the Belgian Grand Prix. A move to Arrows in 1983 made for more consistent results until he parted ways with the team after the fifth round of the season. He won the Brazilian V8 title in 2000 and 2001 and was still racing in the series in 2009. However, it was a fight with compatriot Raul Boesel in the Canadian pit lane in 1982 that he is remembered for. The pair exchanged words then punches, before being broken up by team members.